There are numerous commonly known ways to help keep the brain healthy. For example, eating nutrient-dense foods, regular exercising, even playing brain teasers. But did you know that music can also be a great way to support brain health and function? Music has an astoundingly positive impact upon any one of us, helping enhance mood and relieve anxiety. Engaging with music, whether listening, singing or playing, is one of the most beneficial things the brain can take part in. It connects numerous parts of the brain, and this is essential for neuro-rehabilitation. Music helps re-frame rehabilitation, to take what may be repetitive & boring and make it interesting, to take the focus off something that may be painful. Neurologic Music Therapy (NMT) makes rehabilitation more engaging, personalised and relevant. 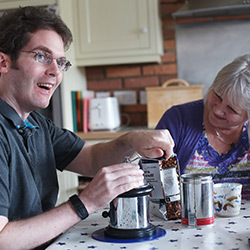 NMT is becoming an increasingly popular form of treatment for those with an acquired brain injury as it can help improve verbal communication, motor control and cognitive function. Understanding the simple ways of maintaining the health of the brain is vital and recognising the importance of music and how certain songs can change your mood, making an individual feel more relaxed and calm. The recognition for this therapy comes down to its creator Dr Michael Thaut. Dr Thaut’s work in this area is renowned as having brought a new clinical and systematic approach to its use in neurology. Over the last couple of decades, NMT has massively grown in stature within clinical environments, and the work done by Dr Thaut has been a major part of that shift. His research into brain function and music has focussed on neurologic rehabilitation of key cognitive and motor functions, frequently enabling those affected by issues such as strokes and brain injuries to make significant strides towards recovery. Every day, we see NMT have a major, positive impact on the lives of those affected. As an intervention, NMT has defined outcomes, is evidence-based, cost-effective and can be used alongside traditional therapies – and the fact that we can evidentially make those statements is in no small part due to the work of Dr Thaut. Due to the overwhelming benefits of NMT, Chroma now has the largest team of Neurologic Music Therapists in the UK who aim to help individuals with acquired brain injury, the change to live as independently as possible and achieve their personal goals. Following intense training, 25 of Chroma’s own music therapists have become certified Neurologic Music Therapists, with 5 Chroma art & drama therapists also becoming certified NMT’s – the only ones in the UK with this training! 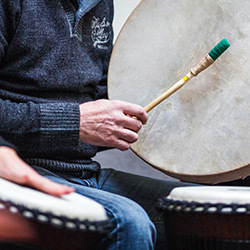 NMT is not simply music therapy. It differs based on its use of the neuroscience model in which music is a hard-wired brain language, not simply a social-science model for wellbeing. Neuroscience research suggests NMT provides specific individualised, and standardised interventions for those affected by neurologic injury or disease. NMT helps improve cognitive, sensory, and motor dysfunctions due to neurologic disease of the human nervous system. NMT is endorsed by the World Federation of Neurologic Rehabilitation (WFNR) and the European Federation of Neurorehabilitation Societies (EFNS).